The developers of a technology that helps clinicians and healthcare professionals to treat people suffering from sleeping problems more effectively has received two high-profile accolades. SleepCogni, which is backed by Mercia Fund Managers, has been named by Corporate Livewire as the winner of the Innovation in Preventative Healthcare Award at its annual Healthcare and Life Sciences event. The Healthcare & Life Sciences Awards 2018 recognises and celebrates leading research firms and medical professionals who have made a difference in their field. The team at Corporate LiveWire closely monitor trends and developments in the health industry to highlight the most successful individuals for their breakthrough research and life-saving services. Nominations for this award came from contributors and readers of the Corporate Livewire and Medical Livewire magazines as well as the Corporate Livewire awards team and information on each nominee was scrutinised by an independent judging panel before the winners were announced. This award comes in the same month that Braintrain2020 appears in the prestigious ‘Longevity Industry in UK Landscape Overview 2018’ report which has been created to outline the history, present state and future of the Longevity Industry in the United Kingdom. 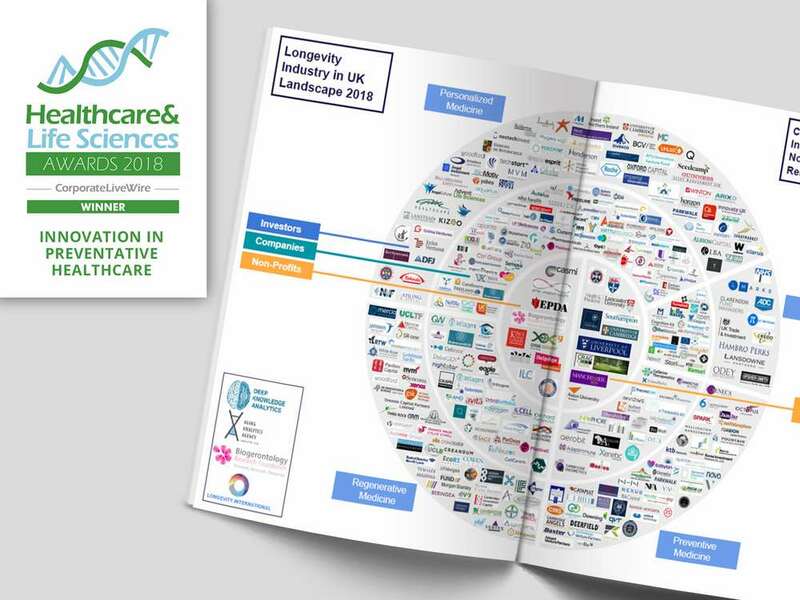 Profiling hundreds of companies, investors, and trends, the report offers guidance on the most optimal ways in which UK longevity industry stakeholders, as well as government officials, can work to strengthen the industry, and allow it to reach its full potential as a global longevity science and preventive medicine hub. The report was created by The Global Longevity Consortium, consisting of the Biogerontology Research Foundation, Deep Knowledge Analytics, Aging Analytics Agency and the Longevity International platform. It uses comprehensive infographics to distil the report’s data and conclusions into easily understandable portions, and interested readers can get a quick understanding of the report’s main findings and conclusions in its 10-page executive summary. Richard Mills, founder and CEO, said: “SleepCogni is going from strength to strength and it’s fantastic that we’re receiving external recognition for our efforts. This month’s award win is a great addition to the list of accolades we’ve already received over the last three years and along with our appearance in the Longevity Report positions Braintrain2020 amongst some of the most exciting medtech organisations in the UK. The fact that the Longevity Report features us in both the Personalised Medicine and Regenerative Medicine sectors is reflective of the fact that truly personalised and bioactive feedback is at the heart of our exciting technology.